Strong, puncture resistant polyethylene tubing. Great for heavy weight items such as nuts, bolts, plumbing, or building hardware. 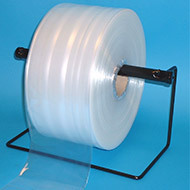 Can be heat sealed with a bag sealer, tape, or staples.